Do you want to learn how to save hundreds of dollars every year? As long as I can remember, I’ve always tried to get the best deal on everything: food, clothes, home decor, haircuts, you name it. By being super frugal on one hand, I get to enjoy the fancier things in life, like traveling or going to nice restaurants. 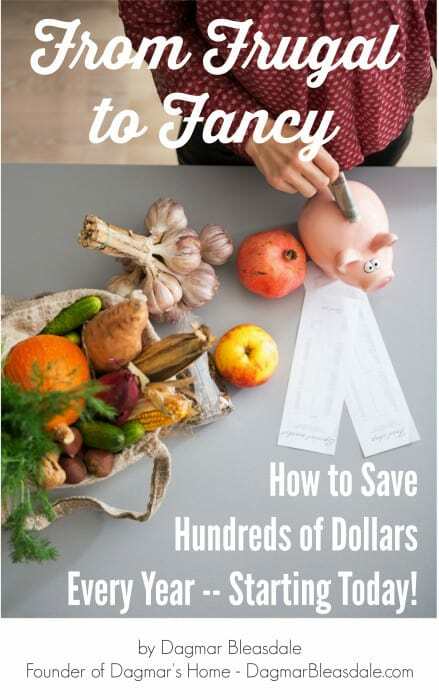 Family and friends always ask me how I save so much money, so I finally wrote down all of my money-saving tips in this ebook. save hundreds of dollars a year – possibly thousands! From Frugal to Fancy only costs $4.99. This ebook pays for itself! Don’t miss out on all of the tips that will save you so much money all year. The introductory price is only going to last for a little while — get it now! You do NOT have to have a Paypal account to buy this book – just click on the options below Paypal for your preferred payment method. Make sure to check your spam folder if you don’t get a purchase email.